There are noises that Caltrain's new EMU fleet might sport a double set of doors, to enable boarding at two different platform heights. While this isn't necessarily ideal, it is a reasonable solution given the constraints of the problem. And yet, the prospect of trains with double the usual number of doors elicits gasps of horror from some transit advocates and industry insiders. Let's go through some frequently asked questions to explore the roots of this choice, and feel free to ask more in the comment section. Q. Do you intend for every Caltrain platform to be rebuilt? A. Yes! Today, the number of Caltrain platforms that support level boarding is zero. In order to achieve the short and predictable station dwell times necessary to operate the blended system with acceptable reliability, level boarding is an operational imperative for Caltrain. The most important thing to realize is that Caltrain will eventually have to rebuild every single platform system-wide -- if not to the same height as HSR, then to some other significantly greater height for level boarding than the current 8-inch standard. Level boarding is not just an option; it is a necessary expense without which blending Caltrain and HSR will fail. Every platform must be rebuilt no matter what; this is the premise from which the rest of the discussion must start. Q. But why insist on compatibility with HSR platforms? Caltrain and HSR are separate systems serving separate markets, so why is this compatibility thing such a big deal? A. Compatibility with high-speed rail is important for two major reasons. First and most importantly, the San Francisco Transbay Transit Center will be a system-wide bottleneck for both Caltrain and HSR, with just six platform tracks. This cramped but critically important terminus will be even more constrained if the two operators are forced to use segregated platforms. In a segregated world, opposing flows of arriving Caltrain and departing HSR could conflict in the station approach tracks, triggering cascading delays should even one train fall behind schedule. With platform compatibility, any arriving train can be routed to any available platform, minimizing the domino-effect of delays. The Transbay designers know this issue is the Achilles' heel of the entire design, which is why they are pushing Caltrain and HSR towards compatibility. The risk of an occasional equipment failure or medical emergency causing a system-wide meltdown depends on the probability of such an incident, combined with the underlying resiliency and flexibility of the infrastructure. A segregated Transbay design is asking for trouble when things don't quite go according to plan. Secondly, compatibility has enormous cost advantages for sharing station infrastructure, as will be seen below. The savings from sharing station infrastructure at just four locations along the peninsula (Transbay, Millbrae, Redwood City and San Jose) could easily exceed the combined cost of converting Caltrain to high platforms system-wide. Compatible platforms if operated carefully will not interfere with HSR security or fare collection methods. They are solely a means to maximize the utility and robustness of the Transbay Transit Center and to reduce the capital costs of building California's HSR system by about a billion dollars (yes, with a 'B'). Q. Why can't HSR just select a train design with low floors? A. It's not that easy. The CHSRA has expressed an understandable preference for service-proven designs, to draw from the widest range of suppliers worldwide. Very-high-speed trains (VHST) capable of speeds greater than 200 mph typically do not have low floors. Nearly all high-speed train designs from Europe, Japan and China for the past several decades have featured high floors, with few exceptions. To achieve level boarding as mandated by the ADA while still drawing from the greatest possible selection of vendors, high platforms are almost a necessity for California's HSR system. The only 200+ mph train with a "low" 30-inch floor is the Talgo AVRIL prototype, still in development. It does not have distributed traction, which will be important in California's mountainous terrain. Notice that ALL the level boarding solutions require dual level boarding, at the 8" legacy platform height and at whatever new level boarding height is selected. Dual level boarding is not an easy problem to solve and usually involves some degree of awkward and clunky mechanisms, be they deploying steps, wheelchair lifts, automatic trap doors, or double sets of doors. Even the supposedly "simple" level boarding scenario at 25" suffers from this complexity, a fact that is either glossed over or completely misunderstood by most advocates of this solution. Q. So who cares if Transbay is so constrained? Can't Caltrain just terminate whatever overflow traffic doesn't fit at the 4th and King terminal? A. Emphatically, No! Transbay is a key destination that every Caltrain must serve, especially at rush hour. 75% of Caltrain riders are commuting to work, and there are more jobs located within a 1/2 mile radius of the Transbay Transit Center than within a 1/2 mile radius of all other Caltrain stops from 4th and King to Gilroy, combined! This enormous concentration of jobs in the heart of San Francisco will only increase with the many new office towers going up today. Terminating even one Caltrain short of this gold mine of ridership would be quite simply counter-productive, a waste of taxpayer money and a failure to meet obvious demand. Q. Do you understand the enormous effort and cost to do this? A. It is a large expense, but also a necessary expense. The cost of raising platforms is not strongly sensitive to height: rebuilding to ~48" is only slightly more expensive than rebuilding to 25", 30", or any other level boarding height. Rebuilding to the same boarding height as HSR creates an opportunity to have the high-speed rail project defray some of Caltrain's expense for the conversion to level boarding. The cost of totally rebuilding every platform is generously $10 million per platform, placing Caltrain's system-wide level boarding tab at (very roughly) $10 million/platform x 2 platforms/station x 32 stations = $640 million, less than half of the cost of the modernization project. On the basis of cost per minute of trip time saved, level boarding beats electrification. Q. Doesn't this whole issue just boil down to a San Francisco Transbay problem that should be solved at San Francisco Transbay? The massive dual-level elevated station, the six-mile approach viaducts, and the "iconic bridge" in San Jose would no longer be required, with platforms shared at ground level within the existing footprint of the Diridon station. Squeezing a fourth track under the Millbrae station, requiring hundreds of millions of dollars of tunneling expense, would no longer be required. A Redwood City HSR station, configured to provide HSR service to the booming northern end of Silicon Valley, to enable Caltrain to make cross-platform transfers from locals to expresses, and to tie in future Dumbarton Corridor service, would have a much reduced footprint and would more easily fit in the available site. Factoring in these infrastructure savings, the cost of converting Caltrain to ~48" is actually negative. It would be unwise not to do it. Q. Won't rebuilding all the platforms take years and be an operational nightmare? A. It will take years, but it can happen with relatively little disruption. Over the past 15 years, Caltrain has rebuilt 37 platforms from the ground up. Caltrain has a demonstrated track record for planning, funding and executing platform reconstruction projects. You'll be hard pressed to find anyone who remembers this causing major disruptions. 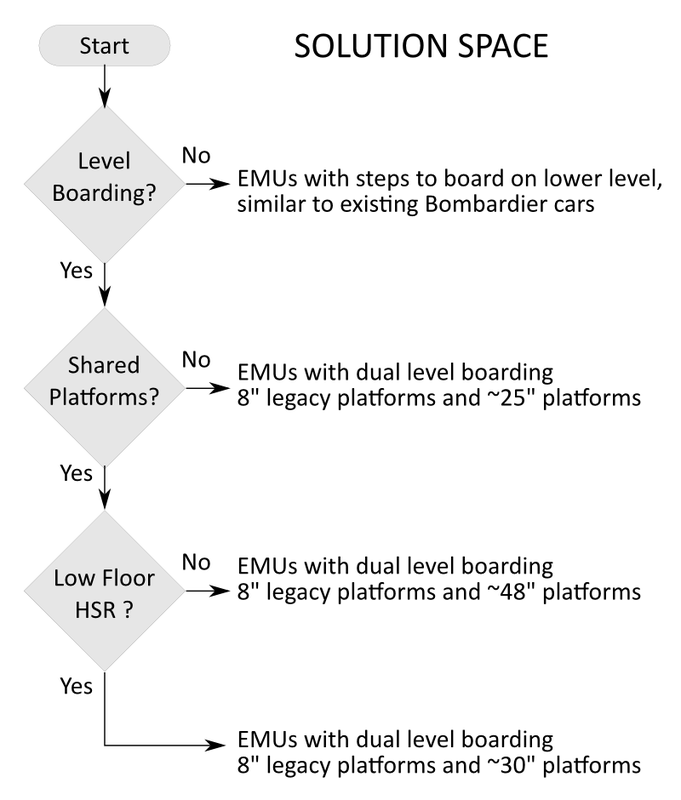 EMUs with dual height boarding would considerably simplify the logistics of rebuilding platforms, since each station could be rebuilt independently as funding becomes available and as the planning process progresses in each community. Q. Will Caltrain end up with a mix of high- and low-level boarding platforms, perpetuating this strange dual boarding height situation forever? A. No. The lower set of doors has only one temporary purpose: to enable boarding from 8" platforms during the transition. All platforms would be rebuilt to ~48", and boarding from the lower level would ultimately be discontinued. Any remaining 8" platforms would become an impediment to the blended system, because they would introduce longer station dwells with a significant probability of unplanned delay when boarding or alighting persons of reduced mobility. Making a mess of the timetable will no longer be tolerable, so there will be a strong incentive to finish the job even at minor Caltrain stops to ensure the highest level of punctuality and system reliability. This makes Caltrain very different from MUNI or some East Coast commuter railroads, where a mix of boarding heights has persisted for decades because there is no operational imperative for 100% level boarding. Q. Until all platforms are raised, wouldn't accessibility and dwell time be worse than they are today? Q. Won't dual sets of doors cause passenger confusion and long dwells? A. Boarding the train will be obvious, based on which doors open. Alighting requires queuing at the correct door, which can be facilitated by color-coding of the doors, LED displays, and audible messages. "Next stop, Menlo Park. The blue doors will open. (...) Next stop, Palo Alto. The yellow doors will open." Blue and yellow are good contrasting colors that can be distinguished by color-blind passengers. People aren't stupid, and should someone get confused, the different doors would be within a few steps and within sight of each other so any mistakes would not lead to significant delays. Q. Won't all these extra doors displace seating areas and reduce Caltrain's seating capacity? A. Not necessarily. Caltrain has estimated that dual sets of doors would displace between 78 and 188 seats per train, or roughly 15 to 25% of a train's seating capacity. This is a temporary situation during the transition to level boarding, and can be mitigated by procuring extra-wide trains with 5-abreast seating and longer 8-car trains to preserve overall seating capacity. The space lost to extra doors can be used by standees, who do not have many good options on today's Caltrain fleet. When the platforms are all converted to level boarding, the lower doors can be removed and additional seating can be installed, especially if this feature is designed into the new EMUs from the outset. In the meantime, to minimize the loss of seating capacity, it would make sense for Caltrain to make seating capacity a selection criterion in the vehicle procurement process. Q. Wouldn't this create an accessibility problem, in terms of ADA compliance? A. No. Just like today, lifts or bridge plates would be required to board persons of reduced mobility from an 8" platform. There would need to be an in-vehicle wheelchair lift to change levels inside the vehicle, to allow wheelchair users to board and alight at stations with different height platforms, or to avail themselves of an accessible bathroom on the lower level. This is not a new technology; these off-the-shelf mechanisms are no more complicated than the exterior lifts used on Caltrain's gallery cars. An example of such a lift can be seen in this video. Q. Will bicyclists have to navigate interior vehicle steps, potentially while the train is moving? A. Yes. These steps could be made wider and shallower (greater tread depth) than anything in today's Caltrain fleet. The three steps from a 25" lower level to a 48" mid-level floor could be fitted with wheel gutters to allow bicycles to easily roll up or down along the stairs. This would make the steps far easier to navigate than the four steep steps up from an 8" platform into a 45" gallery car, turning the corner around a pole through a crowd of Giants fans--the scenario that Caltrain bicycle riders are forced to contend with today. And riders commonly lift, turn and sort their bicycles by destination while the train is moving, so a bit of jostling isn't exactly a new thing for the bike crowd. Q. Wouldn't trap doors resolve this whole situation with dual doors? A. No. Trap doors have numerous flaws, including one fatal flaw: they would preclude Caltrain passing high platforms at speed while still maintaining an ADA-compliant 3-inch gap when stopped at a high platform. Trains sway from side to side when running at speed, and the alignment between the track and the platform edge isn't perfect; that means the space between the train and the platform needs to be wide enough to prevent platform strikes but narrow enough to comply with ADA rules. There is currently no rail system in the United States that can do both: there is either a speed limit when passing platforms (e.g. BART) or the gap when stopped is greater than 3 inches (e.g. Northeast Corridor). Satisfying both constraints (< 3" gap and 100+ mph past platforms) requires a small bridge step to extend from the train when stopped. This sort of gap filler mechanism is unlikely to be compatible with a trap door configuration. Trap doors have other disadvantages, such as increased dwell times while the trap door mechanism is moving, sensitivity to damage from dirt buildup and foreign objects commonly found on train floors, and too many steps up from a low platform during the transition period. Level boarding is not just an option; it is an operational imperative for the blended system. The blended system will not work reliably without it. The new EMU vehicles must enable Caltrain's transition to level boarding, or the chance to convert to level boarding will be lost for another 30+ years, the life span of the new train fleet. It is appropriate for Caltrain to adopt the same platform height and width as HSR, in exchange for the funding to achieve the transition to level boarding. Transitioning to level boarding is complicated regardless of the chosen platform height; there is no easy solution. Dual doors are the path to level boarding with the fewest flaws, under the imposed constraint of high-platform HSR. Caltrain has spent over $15 million on its electrification project so far, primarily for environmental clearance and preparations for procurement. In late February, we found out where a lot of this money went: the Request For Proposals (RFP) for the electrification project was released. This RFP is an incredibly prescriptive document that tells prospective bidders precisely what the project should look like, down to the last bolt. Volume 3 of the RFP (download the 2840 page, 214 MB PDF file) includes layout plans of the overhead electrification system that dictate the exact placement of every single pole foundation. 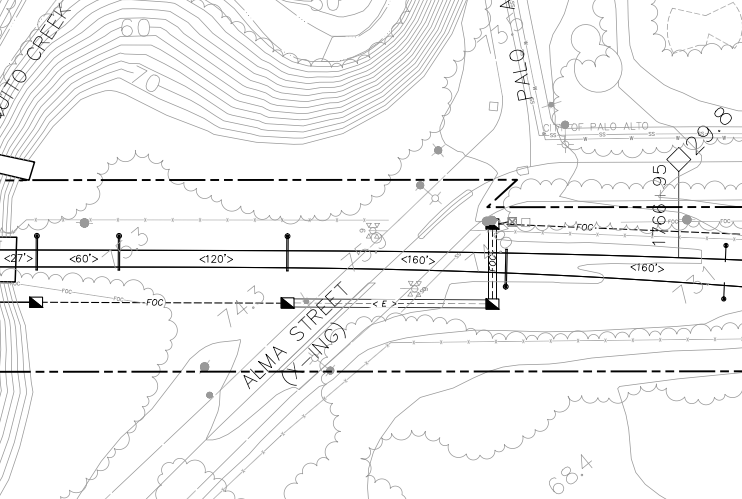 The prospective contractor is admonished that pole locations cannot be changed without first submitting a formal design variance request to Caltrain. This procurement is being carried out as a "Design-Build" where the winning bidder will be tasked with "designing" the project, which in this case will amount to a connect-the-dots exercise to duplicate Caltrain's highly prescriptive preliminary engineering drawings into final construction-ready drawings. What little room is left for creativity and efficiency is stifled by an onerous variance process that requires the "designer" to submit extensive paperwork to Caltrain for approval of the slightest change to the design prescribed in the contract. One can easily imagine how the goal of Design-Build contracting, namely to reduce risk and cost by consolidating decision-making under a single entity, would be lost under the hyper-prescriptive approach that Caltrain has chosen. The thousands of pages of the RFP highlight the cozy symbiotic relationship that exists between government agencies, their in-house consultants, and private contractors. Without an ounce of nefarious intent on the part of any of its participants, this self-reinforcing triangle, hardly unique to Caltrain, brings together hollowed-out government agencies with rubber-stamp boards run by politicians, permanent in-house consultants whose primary motivation is to justify their existence through highly prescriptive decisions that increase scope at their whim, a profit-hungry coterie of construction companies ticking all the boxes for shareholders and labor interests, and a byzantine system of contracting regulations and reporting requirements, quite ironically intended to prevent taxpayers from being defrauded. The results of this firmly-entrenched Transportation Industrial Complex are projects that deliver less and cost more, typically three times the going rate in other first-world countries where government agencies are centralized, smart, and employ an experienced staff of technocrats whose first interest lies in serving the public with better transit at lower cost. What can be done about this system? Not a whole lot. It is the logical byproduct of our decentralized system of government and of our free markets, pursuing their respective enlightened self-interests. These self-interests include neither low cost to the taxpayer nor excellent transit service to the user. The recently-completed modernization of Auckland, New Zealand's commuter rail network, of quite similar technical scope, is an instructive benchmark against which to evaluate Caltrain's modernization efforts.